Is your computer is running slowly? Could it be that a rogue process is interfering with your programs? If so then investigate with the Task Manager, but if problem is related to startup then launch the built-in MSConfig utility. The System Configuration GUI should launch ready for your inspection. If you need check what’s happening at Windows 8 start-up then review each of the Boot, Services and Startup tabs. I recommend that you start your quest for a rogue process here in the Startup tab. This is where all sorts of utilities ‘bully’ their way into your Windows 8 startup routine. Even on a machine that’s working fine, I would review this list, just so you know what’s going on. While it’s tempting to disable some of the Adobe, Logitech or Google items, the disadvantage is that your normal programs will be slower to initialize the first time you use them. Thus be careful before removing any ticks in the first column. If you really don’t want a utility it’s worth visiting the Control Panel, Uninstall a Program. And if there is no corresponding entry, then it’s one of two extremes, a harmless built-in process, or a virus; googling the name will reveal which it is. 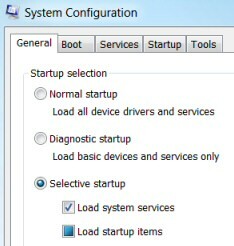 Incidentally, this location column reminds us that many of these startup settings are in the registry. 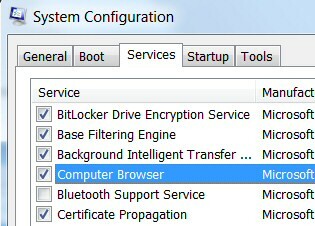 Indeed, if you disable an item MSConfig moves it to a temporary registry key where it won’t be run. For even more control try Sysinternals enhanced MSConfig utility. To me, this is just a reminder of how the Windows Services are configured for startup, I prefer to configure the same information via the Services.msc applet. I rarely change the settings on this General tab, but I would consider checking ‘Diagnostic startup’ if I cannot find the rogue program in the Startup tab. This refers to information held in the Boot.ini file. If your Windows 8 machine takes ages to start then investigate options such as Safe boot with network. You can also see these options be interrupting the regular boot with F8, however the benefit of using MSConfig when troubleshooting is the boot options ‘stick’, until you change them. The advanced tab is interesting, but rarely of much use unless you are a debugger. However, I once found a machine where the Maximum Memory was set way below the amount of RAM installed. It turned out a tester forget to return the setting to it’s default. Another job for the Boot Tab would be on a dual-boot machine where you want to choose the second operating system as the default. Assuming that you have MSCONFIG running. Click on the second tab -Boot. 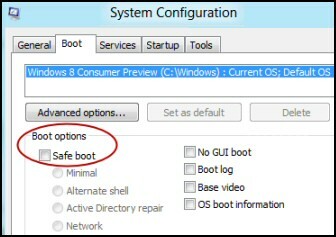 Observe the Boot Options, check the Safe Boot box. You can trace the MSConfig utility in Microsoft’s Windows 8 right back to all those .ini files in Windows 3. See MSConfig on older Windows versions. The Windows 8 Task Manager has been redesigned, in addition to a Services tab, it now has a Startup tab, which could spare the need for calling for MSConfig. If you make changes to MSConfig they are recorded here in the registry. Note: This is the registry setting where you can see which items have been modified or disabled. Launch an executable called recimg. Remember that folder must exist before you create the image. Once you have succeed in creating an image, you can refresh via the Control Panel. See more on Recreating Windows 8. It surprised me that you could employ MSConfig to change the UAC settings. See here for more about MSConfig and Windows 8 UAC. If you take the time to check your Windows 8 system startup settings, then I bet that you find at least one suspicious entry. In my case it was Secunia PSI tray. But then I remember installing this handy software inspector, so in this instance it was a false alarm.